The earthquake in Haiti is heartbreaking. It is painful to see the tear-stained and dusty faces of survivors working to pull wounded and bloody injured relatives and neighbors from the rubble. 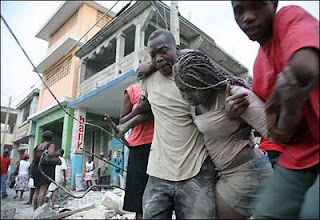 The thousands of deaths caused by this natural disaster are devastating Haiti. The country's already fragile infrastructure has collapsed. These are sad sights that weigh on my heart the same way scenes from Hurricane Katrina and the Asian tsunami did. As communication is established more distressing news from the Caribbean island will come through our television and computer screens. But some of the earliest awful stories about the Haitian earthquake haven't come from the island. They've come from this country in the form of repugnant charity fraud schemes and nasty comments from right-winged commentators Pat Robertson and Rush Limbaugh. Robertson, a Christian commentator of The 700 Club television show on the Christian Broadcasting Network, suggested that Haitians made a deal with the devil to gain independence from the French in the 1800s. Evidence of that deal, Robertson said, is clear because Haiti has suffered a string of tragedies while the neighboring Dominican Republic is prosperous. In the same breath Robertson pleads for his viewers to help Haitians during the earthquake while blasting the nine million residents there. Limbaugh also jumped into the fray saying President Obama's prompt response to the Haitian earthquake was a political move the White House will use to "burnish their, shall we say, 'credibility' with the black community -- in the both light-skinned and dark-skinned black community in this country. It's made-to-order for them. That's why he couldn't wait to get out there, could not wait to get out there." Their comments are among the saddest news I have heard associated with the earthquake. Such rhetoric is unthinkable at a time when the poorest country is the Western hemisphere is experiencing the worst natural disaster in its history. But sadly such comments during a tragedy aren't new. During Hurricane Katrina stories circulated about New Orleans' losses being the city's punishment for being a place where some residents practice voodoo and tourists indulge themselves. Then there were the comments that the crime-ridden, mostly black city wasn't worth rebuilding. The conservative commentators' comments have the same ugly tone. Haitians beat Napoleon Bonaparte's army in 1804 and gained independence from France making it the world's oldest black independent nation. Robertson's fable is out of line. Limbaugh's suggestion that President Obama's rush to help Haiti is repulsive. Connecting aid to this devastated country to racial politics is beyond inappropriate. Haiti needs the world's help not crackpot comments that defy history and decency. Sadly, some relief intended to reach the country may not get there. Charity fraud scams are also surfacing less than two days after the earthquake. The FBI released a warning to Americans looking to contribute cash to Haiti to aid the nation. Just like during Hurricane Katrina, opportunists will no doubt emerge and swipe dollars meant for Haiti's survivors. It is disappointing that while some experience historic loss others use tragedy to gain. Reputable charities such as CARE, the American Red Cross and Yele Haiti are using the efficiency of technology including text messaging to quickly accept donations. Haitian-born Wyclef Jean jumped to help his homeland and is back in the country with his Yele Haiti foundation to provide relief the same way he did in 2008 during the flood. The FBI is warning people to be wise about their donations and check out charities before contributing. Too bad Robertson and Limbaugh didn't take more time to wisely choose their words before speaking about Haiti's earthquake.